I sure do love Merrell. And not just because they are hosts of an awesome mud run (and we all know that’s the key to winning my heart), but because they understand that some of us have a passion for adventure and the outdoors. And they understand that shoes are not about the latest fashion trend in the gym, but they need to be functional, and withstand the beatings we give them out on the trails and the road. This fall/winter I had the awesome opportunity to review the ENTIRE Merrell M-Connect line of barefoot running shoes. Most of the time, when asked to review a shoe for a company, I receive the shoe, and need to have some sort of post done ASAP. This time, I was able to put these shoes to WORK…and we did. Months of training, mud, snow, treadmills…you name it. And finally, the time has come for me to share the review with you. Taking the knowledge of ground feel and connection learned from Merrell Barefoot and blending it with 30 years of leading outdoor performance design, Merrell M Connect takes minimal footwear to the next level through a matrix of intuitive shoes based on the user and the outside athletic activity at hand – running, training, hiking or mixing it up. M-Connect perfectly reflects the Merrell mission to inspire the outside athlete in everyone through products that allow people to connect with their surroundings. Each shoe is built with natural glove-like fit, closer to the ground design for increased ground contact and an outside athletic fast, light and breathable upper for ideal foot movement. What Merrell says: A minimalist running shoe designed with the road in mind, our Mix Master Road Glide creates a softer ride for your stride. 8mm of heel cushioning to 4mm under the ball of the foot creates a cushioned, 4mm platform over a thinner Float™ midsole that gives you greater ground feel and control with less impact. The low profile vegan friendly, breathable mesh upper keeps your feet feeling light and dry. What I say: This shoe flipping rocks. Forget saving the best for last, I’m going to tell you about this pair first: this is my favorite multipurpose shoe in the line. Great for road, trail, mud, snow, and dare I say it (sorry Merrell) the treadmill. It is a minimal shoe without being a barefoot shoe. While I prefer to have minimal drop, for my long runs I still prefer some sort of substance to the shoe. The Mix Master Move Glide provides the best of both worlds. 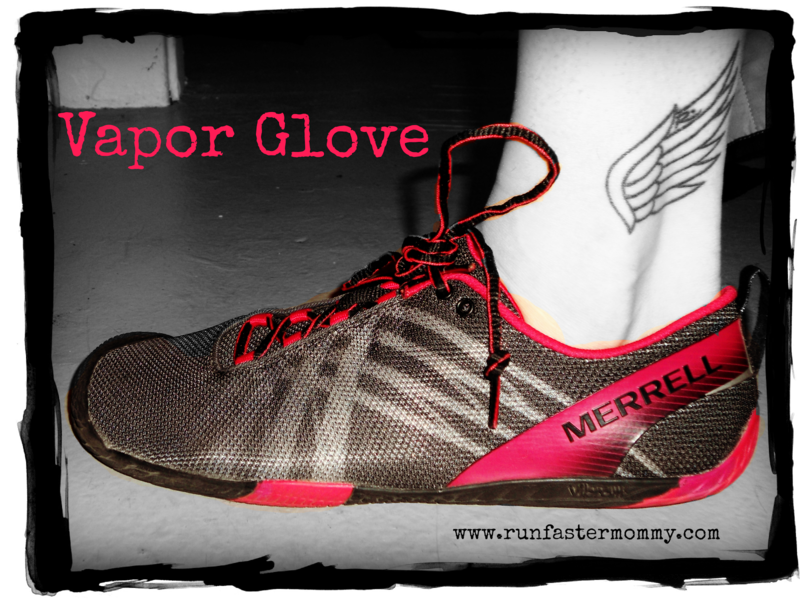 What Merrel says: Give your feet a breath of fresh air on the run with the barefoot breathability of our Vapor Glove. 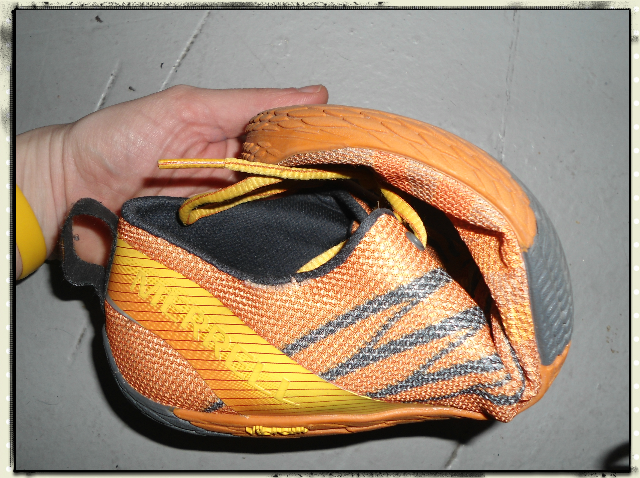 Zero drop cushioning lands your foot pancake flat for full ground contact, merged with its all mesh upper (washable!) that molds to your foot while ventilating heat and moisture. What I say: Aptly named, these shoes are baaaaareeee-fooot. Well, as “barefoot” as I have ever felt in a shoe while actually still wearing a shoe. Incredibly flexible, incredibly light weight, almost as if you are wearing nothing at all. They are far to minimal for *me* to run in, however, I suspect those of you who are VFF wearers will be HUGE fans of the vapor glove. Though they don’t have the crazy “toes” that the VFF’s have (which actually may be a plus for some), they still have a narrow fit with a relatively roomy toebox. They fit like a glove (hence the name!) Now, even though I don’t wear them running, I DO wear them just about everywhere else. To work, to the gym, to the store….they are more natural feeling and comfortable than any other “shoe” I have ever worn before. They are great for recovery days, and help keep my feet in a proper, natural alignment when I’m out and about. What Merrell says: Hiking performance in its simplest, purest form, the minimalist Vim’s ultra-breathable upper molds to your foot with an unprecedented natural, durable fit thanks to patent pending Stratafuse technology. Its close-to-the-ground design allows greater ground sensitivity, increasing responsiveness, control and stability for a fun ride that looks pretty sweet! What I say: This is a great all-weather shoe. Minimal drop, yet still a significant amount of cushion and stack height makes it durable for trails. But don’t let the minimal drop fool you: this is a burly shoe. I even wore mine snowshoeing! 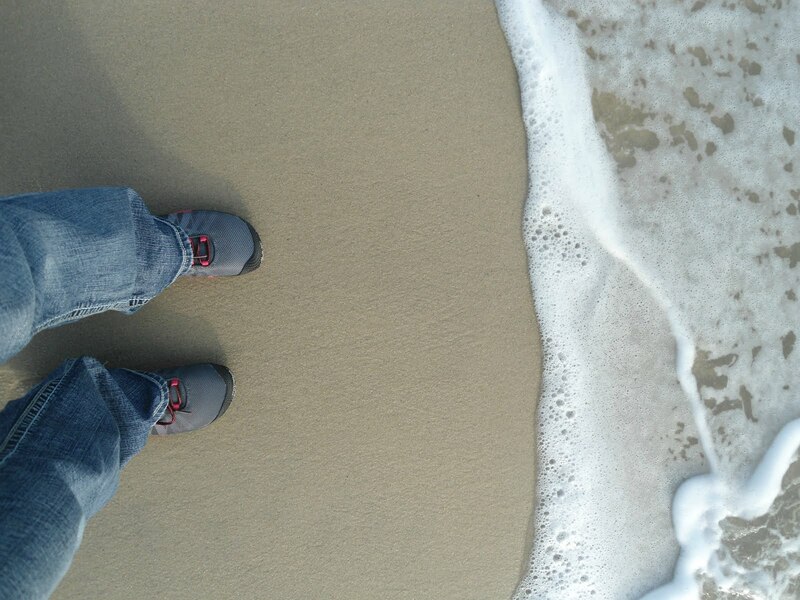 The stiffness of the shoe was perfect for the rugged trails, and the outer was surprisingly waterproof…my feet stayed dry in the snow. These aren’t my first choice for a running shoe due to the stiffness, but are perfect for a hiking our outdoor shoe. And I appreciate the minimal aspects of the shoe, while still having structure to withstand rugged outdoor activities. 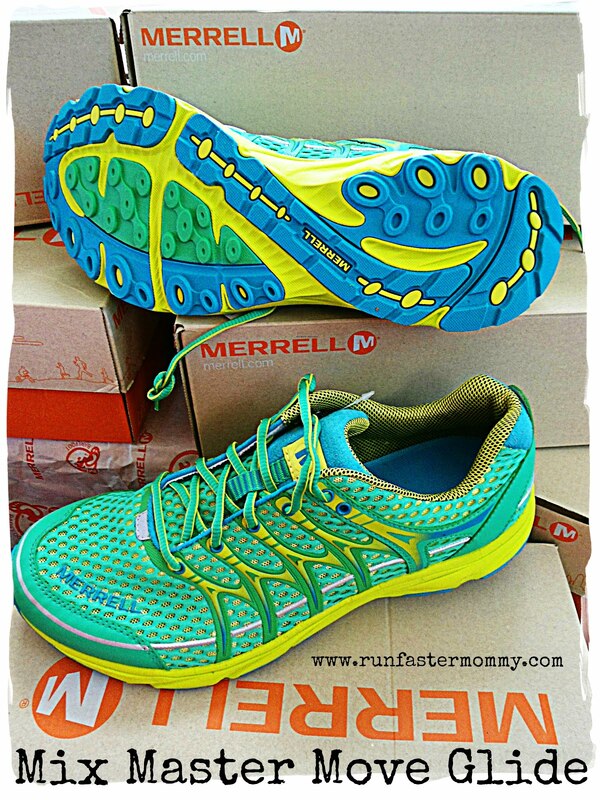 What Merrell says: You want the feel of barefoot, but also some cushioning? Enter our Bare Access Arc 2, which adds uniform toe to heel cushioning that buffers impacts while still letting your foot land flat. Lightweight and low cut, this is perfect for transitioning to barefoot, and features a synthetic leather and breathable mesh upper with rear heel stability. Vibram® pods on the Bare Access Shape sole stick and spring off of any surface. Note: I edited the heck out of this photo, and it probably looks horrible. But here’s why: the picture I originally took did NOT do the color of this shoe justice. So I messed around with saturation and color and other things I know nothing about until it matched my actual shoe. 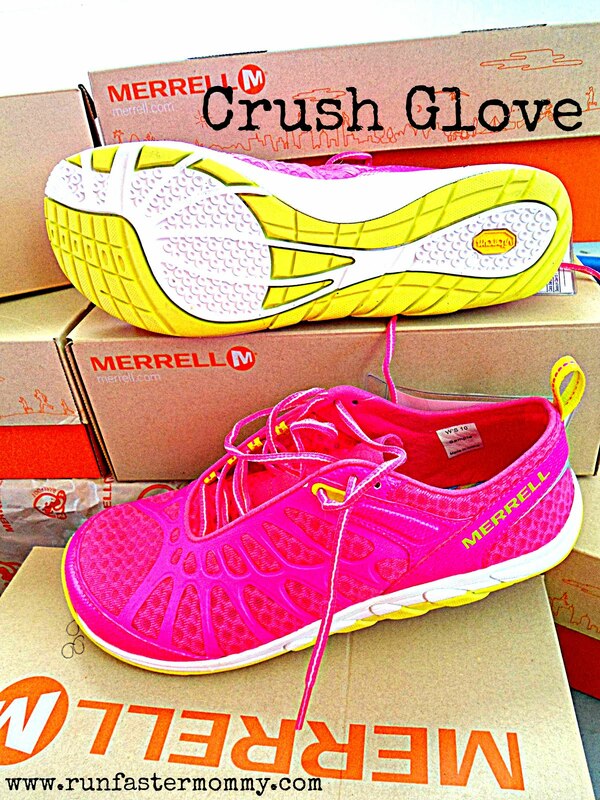 Yes, the crush glove is THAT bright! What Merrell says: Love at first flight — this barefoot-true training shoe will crush your workouts. Still 0mm drop toe to heel, it features uniform cushioning to buffer impacts while still letting your feet land flat, and a flexible sole with a tacky Chrysalis Glove Vibram® traction. Comfort pluses include: a microfiber footbed, breathable mesh on the vegan-friendly upper and anti-funk Aegis® antimicrobial action. 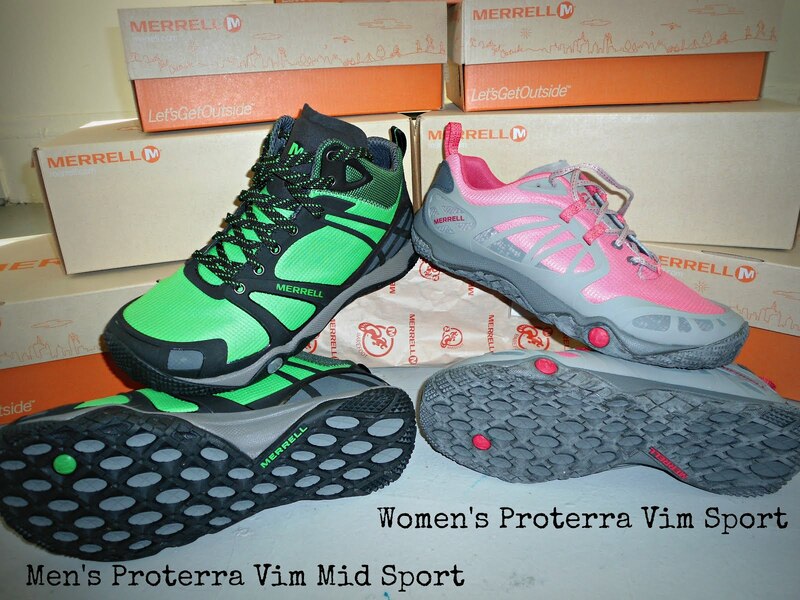 What Merrell says: This is “where the rubber meets the road”. Our Road Glove’s simplicity frees your sole with its barefoot, road-specific design, connecting your feet with the pavement. Its back to basics with this runner: a 0mm drop midsole enhanced with a protective toe cap, midsole cushion and reflective, washable mesh upper. Durable Vibram® Road Glove sole. What I say: I actually didn’t get a chance to review the women’s Road Glove 2. 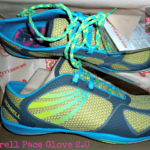 However, Merrell was kind enough to send Geoff some shoes, and he was able to review the men’s Road Glove 2. His thoughts: “The arch feels too high, especially for a barefoot shoe. It wasn’t as flexible as the Vapor glove. 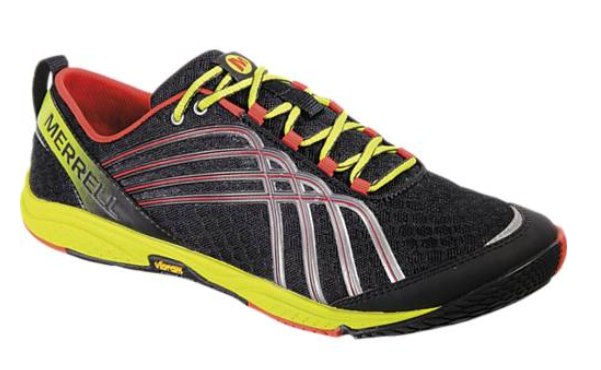 Love the styles available, super light weight, great contact with the gym floor. Great gym shoe, not first choice for running. ” Now, that’s a man who doesn’t sugar coat it. FINAL THOUGHTS: Of course I’m in love with the designs and colors, but there is much more to this line than outward appearance. 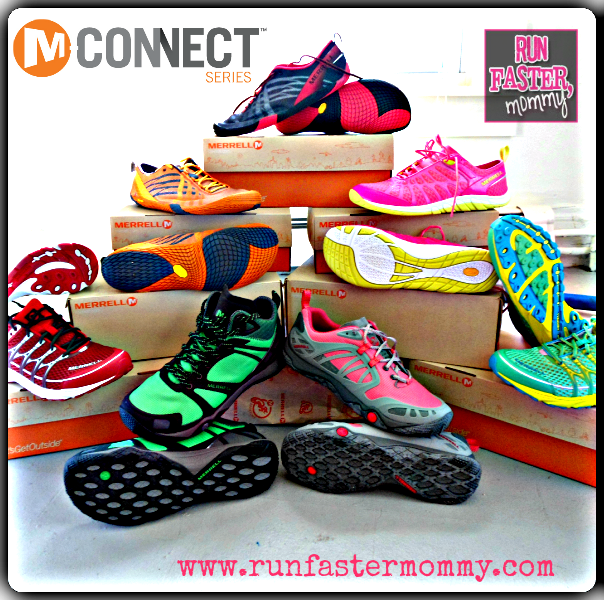 It is clear that Merrell has put a lot of effort and thought into the M-connect series. Bringing a minimal “barefoot” shoe for everyone’s particular needs to the vast running shoe market. We can argue till the cows come home about the benefits of TRUE barefoot running, but research has shown time and time again that most runners can benefit from a more natural, mid foot strike landing and running gait. Minimal and zero drop shoes, such as the M Connect series can certainly help you with that. 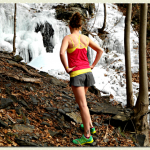 If you are new to barefoot/minimal running, PLEASE check out these great tips from Merrell on how to ease into this transition safely. ﻿So there you have it. 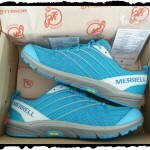 A brief preview of the 2013 M Connect series from Merrell. This was a bit of an overwhelming review to do, with so many specs/information/shoes. But I truly do love this line. If you have any questions about a specific shoe, or the entire line, please comment below and I’ll be happy to respond! Now what are you waiting for? GET OUTSIDE! 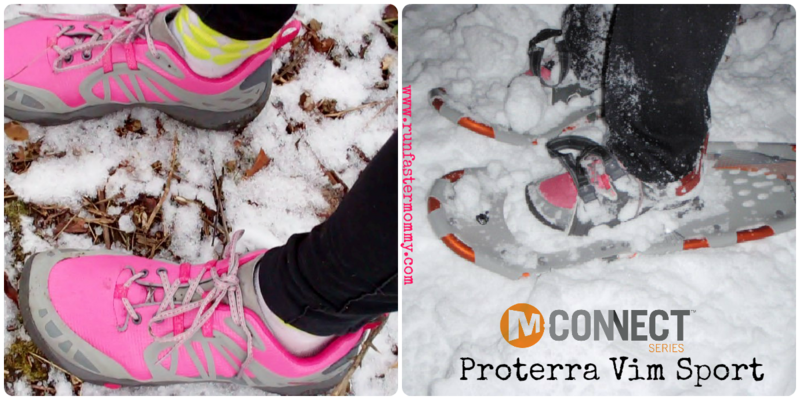 What kind of snowshoes are pictured with the Proterra Vim Sport shoes? Having read your reviews, I’m very interested in the mix master move glide. Anyonymous…those are Louis Garneau Pulse 930’s. They are hand-me-downs and WAY too big for me :/ But they are better than nothing! Hey, I’ve actually got a question about the Move Glide fit. If I wear a 9.5 in pace glove should i order the same size. guess i’m asking if the move glide have a similar fit (from your experience) or does it run small or large? I think I kind of need the mix master move glide now for all the mud runs I’m doing this year! Thanks for the review. Thank you for the information about the snowshoes! What an awesome opportunity to review the whole line! Great reviews! Hello my famіly member! ӏ want to say that this рost іs amazіng, nice ωritten and come ωіth almost all іmportant infos. Ӏ wοuld lіke to pееr extrа posts like this .